Way back in March, we took a look at some nefarious cubicle weapons and how cubicle wall extensions might help keep workers safe. Well, the cubicle arms race is far from over. More and more ingenious weapons are being invented all the time. You can check out the latest array at Arnold’s Office Furniture. The list of “Weapons of Mass Cubicle Destruction” include such childhood favorites as the popsicle stick and plastic spoon catapult. 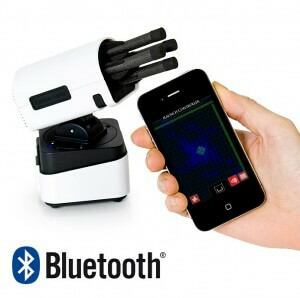 On the high tech side, there’s a smartphone guided foam missile launcher. Yes, you do need to click through and see that pricey toy to believe it! Let’s stop this senseless stockpiling of cubicle weaponry. Use cubicle panel extenders as your strategic defense initiative. At OBEX, we’re always on the lookout for new products that can enhance worker satisfaction with the cubicle environment. Here’s a pretty interesting one that addresses a common complaint among office employees – glaring fluorescent overhead lights. Some people would much rather work with a small LED task lamp and the glow from their computer screen as their main sources of illumination. For these individuals, an overhead canopy might be a very valuable option. That’s the accessory that CubeShield has created. 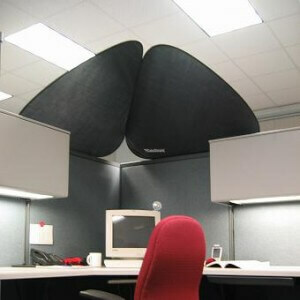 These lightweight shields attach to the top of fabric covered cubicle walls using Velcro. That makes installation and removal a breeze. When not in use, the shield is small enough to fold up and store in a workstation drawer. Obviously, for this tool to work, it needs to be mounted on a fairly high cubicle wall. That’s where our panel extenders come in. You can top low cubicle walls with an extender to bring them up to head height, then cap them with a canopy to create the ultimate employee cocoon!